Jewel themed uk slots are unique casino games to play. The sparkling gems, rubies, and diamonds on the reels and the colour they radiate make it very appealing to play. In this article, we have picked a selection of dazzling jewel-themed slots that you should play. 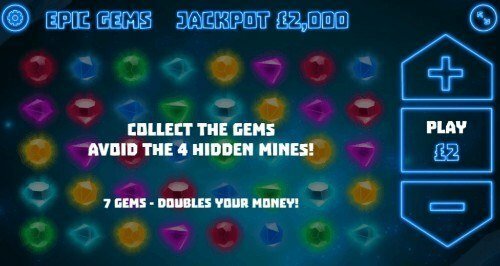 Gem Rocks online slot has an unusual theme and features. 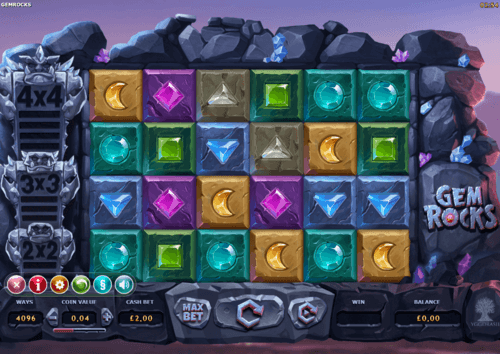 In this slot game by Yggdrasil Gaming, the gems of this game are rock shaped gems. Gem Rocks comes with 6 reels and 4096 ways of winning. These are unlike the typical 5 reels and 243 ways of winning. The reels are set up against a rock background. The unique design of this game makes it an interesting one to play. This slot game comes with scatters, wilds, free spins and bonus features that are fascinating. Gem Rocks comes with an RTP of 96.20%. This makes it a less volatile game to play. Epic Gems by Gamvy has a colourful and vibrant design. This instant game will expose you to forty bright gems that will reward you if you should avoid four of the bad gems. Epic Gems created by Gamevy has an RTP of 96.50%. The music of the game is galaxy styled and enhances the playing experience. You can play this game to win up to 25,000x top prize. 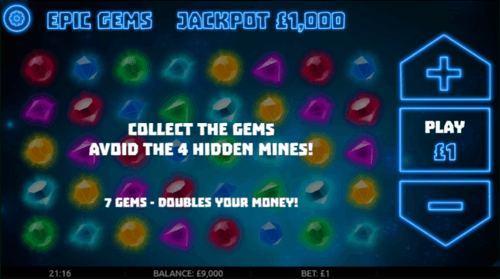 Gems N Jewels online slot, developed by Saucify, has graphics that are rich and colourful. This is complemented by a calm and relaxing music. Gems N Jewels is played on 5 reels and 50 paylines. The diamond of the game is the wild symbol. It substitutes other symbols except for the scatter symbol. The scatter symbol is a red ruby. You can trigger the free spins of this game and get your wins tripled. Gems N Jewels comes with an RTP of 96.52%. Get in, play a galaxy of vibrant gems, and play for fun. 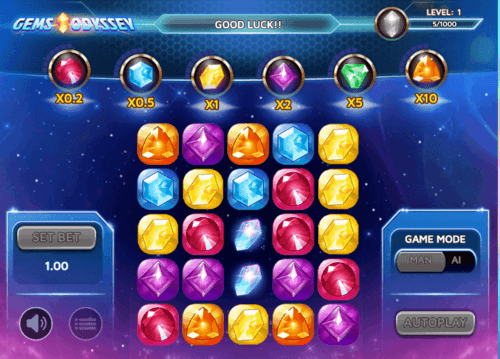 Gems Odyssey by Skillzz Gaming has a 5x5 grid system that can be played starting from a minimum bet of 0.60 to a maximum of 100.00. The theme of the game is that of a solar system. In this game, you have to land up to 3 symbols on the reels and fill the bar above up to 7. The precious gems in this game are 6 including yellow amber, red rubies, green emeralds, sapphires, orange garnets, and amethysts. This game comes with 5 different bonus features that will enable you to increase your winnings. 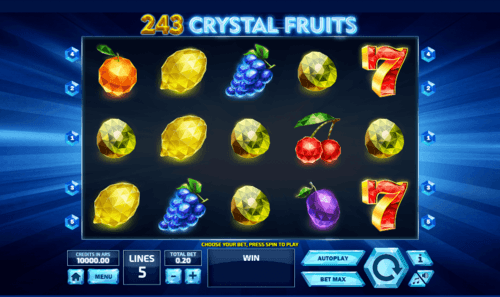 243 Crystal Fruits online slot features fruits with crystal looks to offer you a distinctive and striking effect. Tom Horn Gaming has kept the design simple to make it playable for all level of slot players. This game has only 5 reels and 5 paylines. This game is played starting from 0.05 all the way to 10.00 per spin. This game with an RTP of 96.55% comes with wilds, scatters and free spins. 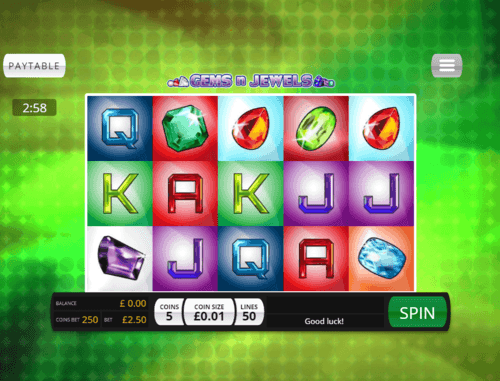 These colourful and brilliant looking gem themed UK slot games can be played here at Rose Slots. We are compatible with Android, iOS, Mac and Linux devices, laptop and desktop.